The Muslim rule in India robbed off India from some its most precious treasures in terms of temples and knowledge centers. The towering temples that once dotted entire nation were pulled to the ground and it was especially North India was almost completely robbed off its temples and South India was a bit lucky to face a lesser aggression in this case due to the geography. Temple materials were either destroyed and left in ruins or were used to construct Islamic Dargahs, Mosques, Khanqahs, Mazars, Tombs. Some of the Islamic structure stand directly on top of the destroyed temple sites. Sadly, it was not only Hindu temples but Buddhist sites and Jain temples were also destroyed by Muslim invaders, so, the entire Dharmic society suffered as a whole. The temples destroyed ranged in thousands but here is the list of some 10 popular ones. One of the oldest temple ruins, it is now called “Shaitan ki Gufa” (Devil’s cave) by Kashmiri Muslims. It was featured in the Bollywood movie, ‘Haider’. It was part of the Karkot Empire (A Naga Kingdom) which was in continuous strife with Gandhara’s Suparna (A Garuda Kingdom). Hence, even today, an eagle is taken for a sign of devil in Kashmiri folklore. Perhaps a scintillating piece of architecture, this temple could have awed everyone who saw it. It was made by King Lalitaditya in around 5th Century A.D. and it was destructed by Muslim ruler Sikander Butshikan. It is believed that it was so strongly built that it took many days for its destruction. The temple now lies in ruins near the district of Anantnag. Modhera was built around 10th century under Solankis. It was a majestic temple with perfect Vaastu which had each pillar carrying with itself a history and purpose of its own. It carried with itself a Kund (stepwell), something that Indians continued from the mother civilization of Sapta-Sindhu. The Solankis were worshippers of the sun as they called themselves Suryavanishis or the descendants of the Sun God. King Bhimdev had built this temple in the 11th century dedicating it to Surya. It is believed that the worship of Surya would have dated back to the 5th century BC and it lasted almost until the medieval period. Modhera’s story dates back to the Ramayana according to legends. It is believed that Lord Rama arrived here on Sage Vashistha’s advice to wash off his sins for committing Brahma-hatya as he had killed Ravana, a Brahmin by birth. He came to a village called Modherak to perform a yagna and called it Sitapur. According to the Puranas, it is believed that the region was called Dharamaranya and the village later came to be known as Modhera. The temple was plundered by Mahmud Ghazni who took the original idol that was carved in gold, which was then housed in a deep pit covered with gold coins. The shrine was eventually destroyed by Alauddin Khilji before it was restored recently. However standing there and seeing it sparkling in the evening sun’s rays, I realize that the sun may have set on the Solankis many centuries ago, but their monuments speak of their glory. According to the Hindus, the land on which the Babri mosque was built in 1528 is the ‘Ram Janmabhoomi’ (birthplace of the god-king Rama). But, Mir Baqi, one of Mughal king Babur’s generals, is said to have destroyed a pre-existing temple of Rama and built a mosque called Babri Masjid (Babur’s mosque) at the site. Both the communities have worshiped at the “mosque-temple”, Muslims inside the mosque and Hindus outside it. Some say that the Temple of Lord Ram at Ayodhya was pulled to the ground by Babur but some believe that the temple was destroyed by previous Islamic rulers as the mosque structure does not belong to that era. However, it is doubtless that a temple existed and people from centuries used the site to worship Lord Ram. With strong archaeological evidence now available a large temple base was found at the Babri Masjid site. Kashi Vishwanath Temple is one of the most famous Hindu temples dedicated to Lord Shiva and is located in Varanasi, the Holiest existing Place of Hindus, where at least once in life a Hindu is expected to do pilgrimage, and if possible, also pour the remains (ashes) of cremated ancestors here on the River Ganges. The main deity is known by the name Vishwanatha or Vishweshwara meaning the Ruler of the universe. The temple town that claims to be the oldest living city in the world, with 3500 years of documented history. However, the original Jyotirlinga of Kashi Vishwanath is not available. The old temple was destroyed as a result of the Mughal invasion. Historical records suggest that it was destroyed many times by Muslim rulers. A choice target for Muslim invaders, the prominent edifice was destroyed in 1194ce, then rebuilt 20 years later, only to be demolished again in the 15th century. Under the reign of the unusually tolerant Akbar in the 16th century, it was rebuilt once again; but Akbar’s grandson, Aurangzeb, destroyed it yet again in 1669, building Gyanvapi Mosque in its place. The present temple was erected a few feet from the mosque in 1780 by Maratha queen Ahilya Bai Holkar. The gold roof seen in the photo below was donated in 1839 by Maharaja Ranjit Singh, the Sikh ruler of Punjab. The Sri Krishna Janmabhoomi temple, also simply called the Krishna Janmabhoomi, Krishna Janmasthan or Kesava Deo Temple is located in the holy city of Mathura, Uttar Pradesh. Like the Dwarkadish Temple in Dwarka, Gujarat, the Krishna Janmabhoomi temple is also said to have been built by the Hindu god Krishna’s grandson, Vajra. Legends say that Mathura is said to be the birthplace of the god, and locals believe that the temple was made 5,000 years ago. While the mythical Yadava king is credited for its creation, the temple underwent a significant upgrade during the reign of Chandragupta II, around 400 AD. After being demolished in 1017 AD, the temple was rebuilt by Bir Singh Bundela or Vir Singh Deo, an Orchha king under the Mughal Empire. The Krishna Janmbhoomi temple was also destroyed by emperor Aurangzeb and a Dargah was built above the Keshava Deo Temple. It was a majestic temple and still can be seen from miles away. With the next temple only being built in 1965 after a long political dispute that is still ongoing. This fourth temple is what you see today, but the historical center of this place remains unchanged; you can still see the ancient prison cell where it is said that Krishna was born on a dark, rainy night. Inside the mosque, broken and defaced sculptures inside the mosque made up of temple ruins. There is stone installed by ASI that proudly states the fact that this site was actually made by the ruins of the temple. Located in Prabhas Patan near Veraval in Saurashtra on the western coast of Gujarat, Somnath Temple is believed to be the first among the twelve Jyotirlinga shrines of Shiva. It is an important pilgrimage and tourist spot of Gujarat. Destroyed and reconstructed several times in the past, the present temple was reconstructed in Chaulukya style of Hindu temple architecture and completed in May 1951. The reconstruction was envisioned by Vallabhbhai Patel and was completed under K. M. Munshi, the then head of the temple trust. In AD 1026, Mahmud of Ghazni first looted the temple, and then came Afzal Khan, the commander of Alauddin Khilji and later Aurangzeb. It is said that the temple was looted and destroyed as many as seventeen times. The great Temple was sacked again and again from Ghazni to the Muslim dynasties of Gujarat to the Portuguese and up till Aurangzeb. A symbol of a great civilization laid in ruins till Vallabhai Patel decided to rebuild it. The entire temple priests were massacred and the temple valuables looted during the sack by Ghazni. There is also an interesting story that Muslim invaders believed that the devils idols are kept in the temple of Al-Lat etc. and that is why it was sacked again and again. It is known that many pre-Islamic Arabians came to this temple for pilgrimage as the god here represented their moon god. Hampi, the seat of the famed Vijayanagara empire was the capital of the largest empire in post-mogul India, covering several states. Around 350 km from Bangalore, the empire reigned supreme under Krishnadevaraya, the Emperor. The destruction of Vijayanagar by marauding Moghul invaders was sudden, shocking and absolute which reduced the city to ruins. The ruins of Hampi of the 14th Century lies scattered in about 26 sq. km area, amidst giant boulders and vegetation. Protected by the tempestuous river Tungabhadra in the north and rocky granite ridges on the other three sides, the ruins silently narrate the story of grandeur splendor and fabulous wealth. The splendid remains of palaces and gateways of the broken city tell a tale of men infinite talent and power of creativity together with his capacity for senseless destruction. When the Vijayanagar empire fell after the Battle of Talikota havoc rained in Hampi the capital city of the great empire for months. The major structures be it religious or civil were set ablaze or pulled to the ground by the Muslim armies. The entire population was massacred and no one was spared. Many Many temples were destroyed and only those which were large and strong were able to survive this holocaust and iconoclasm perpetrated by Islamic armies. A ruined temple complex of Rudra Mahalaya is located at Siddhpur in the Patan district of Gujarat. Siddhpur is an ancient holy town on the banks of river Saraswati. The town of Siddhpur derives its name from the ruler of Gujarat, named Siddhraj Jaisinh, who built a magnificent Rudra Mahalaya temple in the 12th century AD. The construction of Rudra Mahalaya was started in 943 AD by Mularaja Solanki and was completed in 1140 AD by Siddharaj Jaisinh. The temple was dismantled by Allauddin Khilji during 1410-1444 and later Ahmed Shah I demolished this temple and converted some part of it into the conjoint mosque. In the 10th century Mularaja Solanki, the founder of the Solanki dynasty of Gujarat, began the construction of Rudra Mahalay temple. As per the local folklore, Muladev’s crimes hung heavily on his mind during his old age. To get rid of his bad deeds he built Rudra Mahalaya. However, the construction remained incomplete due to unknown reasons. Siddharaj Jaisinh established the temple complex during the 12th century and it became the prime temple complex of Siddhpur. According to another legend, Govinddas and Madhavdas took up their haunt among the grass that covered the neighborhood of the Rudra Mahalaya. They found a shrine and Shiva Linga. This led to the erection or completion of the temple. Then the astrologers had predicted the destruction of the building. Then Siddharaj put up the images of many great kings in the temple, along with a representation of himself in the attitude of supplication, with an inscription saying that, even if the land was laid waste, this temple will never be destroyed. In 1296 AD, Mughal king Alauddin Khilji sent a strong army under Ulugh Khan and Nusrat Khan Jalesri who destroyed the temple complex. The temple was further demolished and the western part was converted into a mosque by Ahmed Shah I of Muzaffarid dynasty. 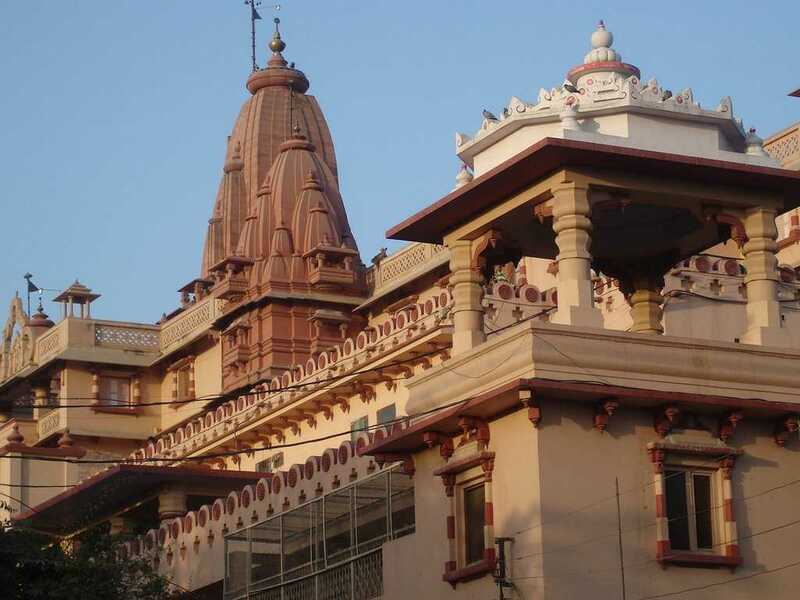 The Madan Mohan Temple located near the Kali Ghat in Vrindavan is one of the oldest temples built in this region. In the olden days, the area where the temple is located was just a wild forest. The original statue of Lord Madan Gopal does not lie in the temple anymore. During Aurangzeb’s rule, it was shifted to Rajasthan to safeguard it from destruction. During the Mughal era several Hindu temples were destroyed. Today, a replica of the original image is worshipped at the temple while the original one is still kept at Karauli in Rajasthan. The temple is smaller than other ancient structures but is adorned with beautiful carvings. Tall and narrow in shape, the present red colored structure was constructed in the 19th century by Shri Nandalal Vasu. The original one was destroyed during the Mughal conquest. During the attack of Aurangzeb on Vrindavan, the spire (Shikhara) of the original temple was dismantled. So, a new temple was built next to it down the hill in the early 19th century (the year 1819) by Sri Nand Kumar Bose of Bengal as the old temple was unfit for worship. Meenakshi Temple is an ancient and one amongst the most important temples of India. Located in the holy city of Madurai in Tamil Nadu, Meenakshi Temple is dedicated to Sundareswar ( a form of Lord Shiva) and Meenakshi ( a form of Goddess Parvati). The term “Sundareswar” suggests “the beautiful lord” and “Meenakshi” means “the fish-eyed goddess”. As per the Hindu folklore, Madurai is the same city where Lord Sundareswar (Shiva) appeared to marry Goddess Meenakshi (Parvati). Meenakshi Temple is regarded as one of the most sacred places of Parvati.